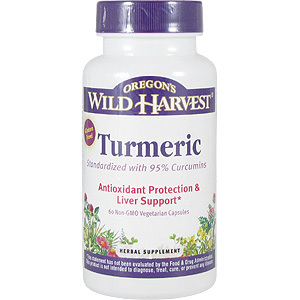 Turmeric is a highly regarded spice used in Ayuvedic and trational Chinese medicine. Turmeric standardized with 95% Curcumin. 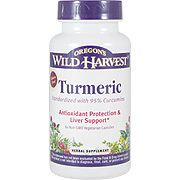 Turmeric's antioxidant properties provide protective nutritional support to the cardiovascular system, joints and liver. Standardized turmeric extract supplies enhanced levels of the principally active constituent curcumin. Scientific studies show that the addition of Bioperine improves curcumin absorption, increasing bioavailability to the body. 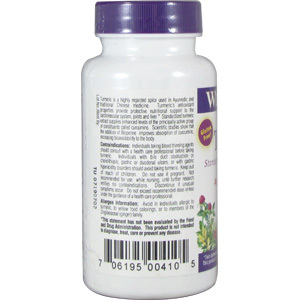 As an herbal supplement, take (1) one capsule one to three times daily with food. Contraindications: individuals taking lood thinning agents should consult with a health care professional before taking turmeric. Individuals with bile duct obstruction or cholelithiasis, gastric or duodenal ulcers, or with gastric hyperacidity disorders should avoid taking turmeric. Do not use if pregnant. Keep out of reach of children. Discontinue if unusual symptoms occur. Do not exceed recommended dose unless under the guidance of a health care professional. Allergen information: avoid in individuals allergic to turmeric, to yellow food colorings, or to members of the Zingiberaceae (ginger) family. 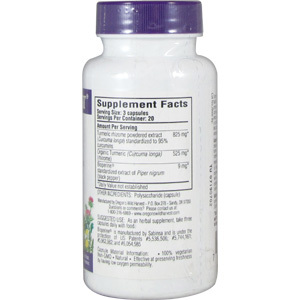 Turmeric extract (curcuma longa) (root) standardized to 95% curcumin: 275mg, Organic Turmeric (curcuma longa) (rhizome): 175mg, Bioperine standardized extract of piper nigrum (black pepper) and/or piper longum: 3mg. Turmeric is shipped in a discrete, unmarked package. Orders are processed immediately and usually take about 3 to 5 working days to be received. We do ask that you try it for 2 to 3 weeks to feel the full effects. Any information received is used only for order processing and shipping purposes. Your information, such as e-mail address, will never be disclosed to a third party.